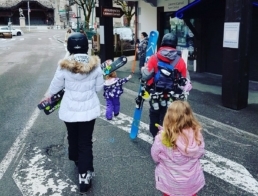 I’m not going to lie, family ski holidays can be stressful, expensive and you will no doubt wonder what on earth you are doing as you are trying to carry all the children’s gear, and them, trying to find the ski school! However, you can avoid these stressful situations by researching family friendly ski resorts and find a chalet company who will have everything covered. Ski resorts such as Morzine are keen to welcome children of all ages to the slopes and have a fantastic range of English speaking ski schools and catered chalet companies for you to choose from. Chalet companies such as AliKats, a multi award winning chalet company set in the scenic area of Montriond, organise everything from the airport transfer to ski hire and a private chauffeur to and from the slopes. For ultimate relaxation, they can also organise a masseuse to come to the chalet. Not only do Al and Kat make sure you have a fantastic holiday, they also make sure you never go hungry! The hosts cook up fabulous hot breakfasts to get you piste ready and at the end of the day you always walk into an Alikats chalet smelling the delicious aromas coming from the kitchen. Kat, the co-owner and head chef, takes great pleasure in planning delicious meals using ingredients that are locally sourced, free range and seasonal for you to enjoy. We have sampled some of Kat’s dishes and can confirm, the food really is ‘ridiculously good’! So, I know what you’re thinking. 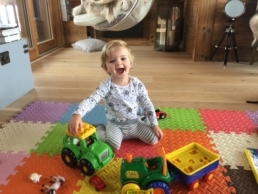 How can we relax and enjoy all of this whilst on a family holiday? 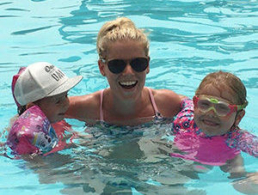 You have a number of options, there are creches, private nanny companies or you can hire a Vacation Nanny to accompany you on your holiday. Helping on transfer days and be the in-house babysitter. How very decadent! This option may sound very personal, but in a shared catered chalet this option can work brilliantly and help take the stress away. A ski holiday as a family is a place where fantastic memories are made and an activity you can share together in years to come.